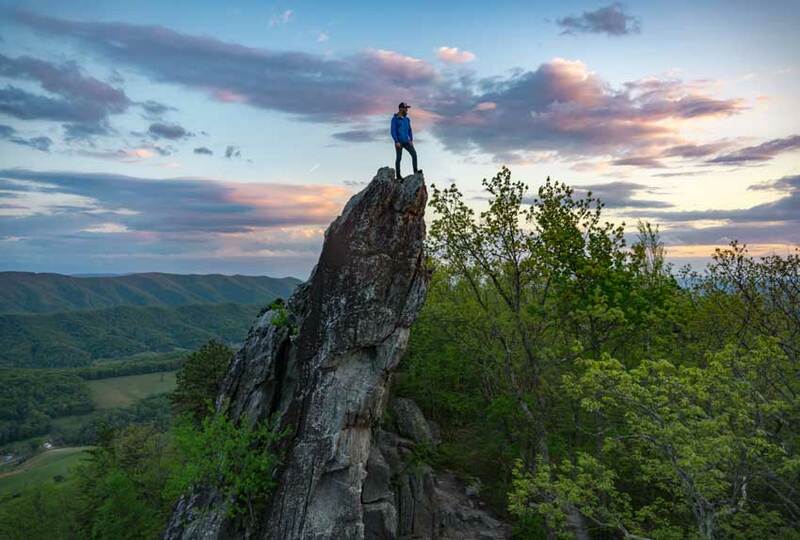 Virginia is full of adventure for outdoor lovers, whether you’re into kayaking, biking, hiking, or even extreme sports like ATV off-roading or hang gliding. Not sure where to start planning your outdoor excursion? We’ve mapped out some of our most iconic outdoor spots to create a memorable adventure. Take a day, a weekend, or even a full week and discover why Virginia is for Outdoor Lovers! Inside the numerous National and State Park systems in Virginia, you’ll uncover some of the most idyllic scenery in America. 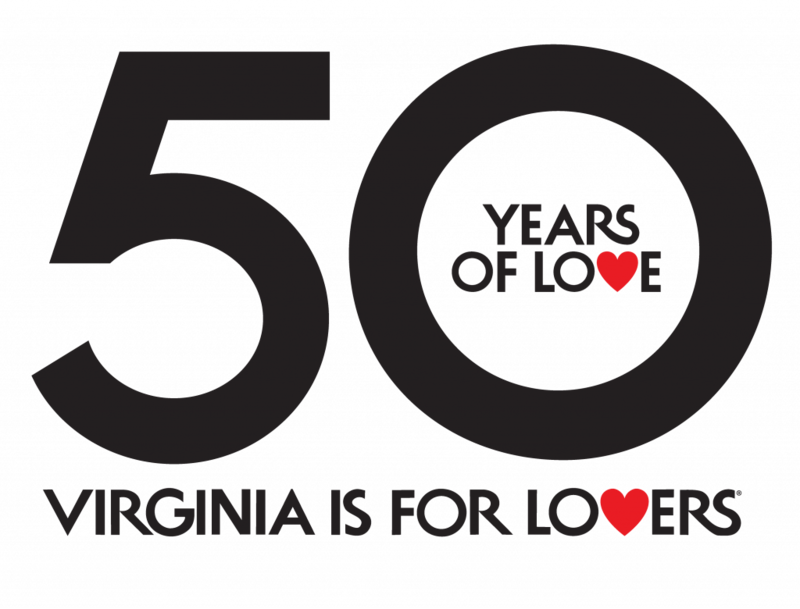 From the pristine beaches of Assateague Island National Seashore on the Eastern Shore to the rushing waterfalls at Great Falls National Park in Northern Virginia just a few miles from the hectic streets of Washington, D.C., you’ll find a park that preserves Virginia’s beauty in every corner of the Commonwealth. Possibly the most famous park in Virginia, Shenandoah National Park includes Skyline Drive, a 105-mile route through the Blue Ridge Mountains. The 300-square mile park is carefully maintained to preserve the rolling landscapes that have been immortalized in numerous songs, poems, and novels. Head to Shenandoah National Park year-round to explore the world-class hiking trails, but the scenery is especially impressive during the fall when the foliage covers the mountains with striking hues of orange, red, and yellow. One of the few remaining areas along the Atlantic coast that is completely undeveloped, False Cape State Park is even more astounding due to its close proximity to Virginia Beach, one of the state’s most thriving beach areas. The beachfront park houses a huge migratory bird population and is teeming with coastal wildlife. The park bars vehicular access to the park, which serves to keep the park even more untouched. Instead, the park is accessible by foot, bicycle, tram, or boat. Upon reaching the beaches, you’ll realize what a treasure this park truly is. Plan ahead and reserve a campsite on the beach for a unique camping experience on Virginia’s shores. Like beautiful scenery, hiking through the mountains, and wild ponies? If you answered yes to any of the above, plan a trip to Mount Rogers National Recreation Area in Southwest Virginia. 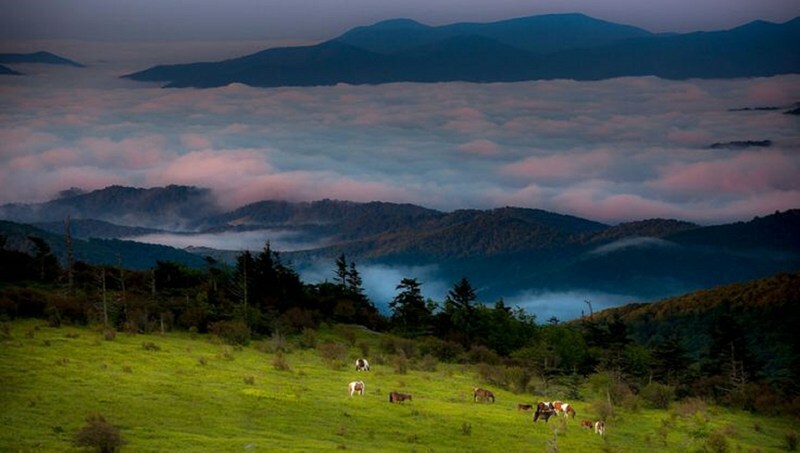 The expansive preserve contains 200,000 acres of mountains between Damascus and Galax, including Grayson Highlands State Park (if you’re in it for the ponies, this is where you need to be) and Mount Rogers, the highest point in Virginia at 5,729 feet. With over 500 miles of trails within the park, you’ll need several days at least to get the full Mount Rogers experience, but numerous campgrounds within the recreation area accommodate visitors that wish to stay overnight. Kayakers and canoers can find all types of waterways in Virginia, including quiet flatwater lakes, rushing rivers with epic rapids, and the wide open waters of the Chesapeake Bay. Beginners can hire guides to take them out on the water, while experienced paddlers will find the experience they seek around every bend. 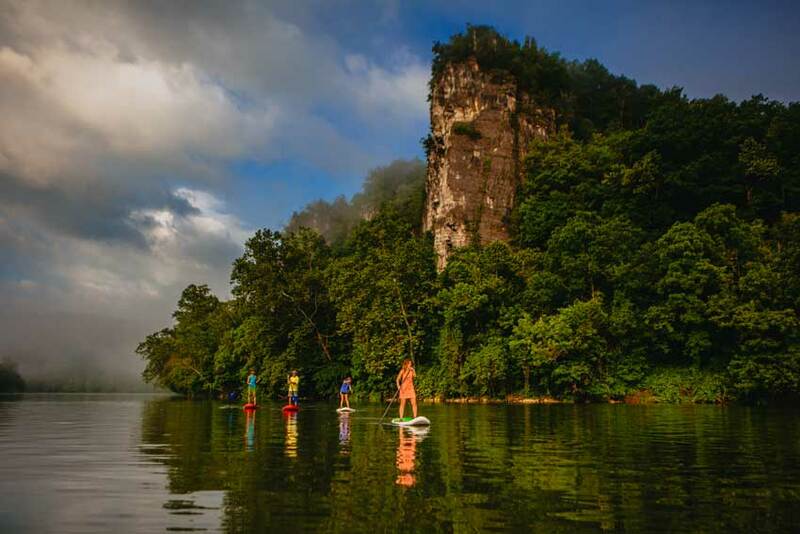 Located in Pulaski County in Southwest Virginia, Claytor Lake State Park is popular for boating, fishing, and swimming, but the latest craze to hit the waters is stand-up paddleboarding, led by Mountain2Island Paddleboard Company based out of Hiwassee. The shop offers rentals, lessons, tours, and unique classes like SUP with your Pup, a dog-friendly paddleboard trip, as well as Paddleboard Yoga and Full Moon Paddleboard tours. Paddle through the scenic Shenandoah Valley with Massanutten Adventures, a local outfitter that provides canoe, kayak, raft, and tube rentals on the Shenandoah River. Only ten minutes from Harrisonburg and 40 from Charlottesville, you can spend the day paddling some of Virginia’s most breathtaking waters and then head back into these cities for a taste of the Commonwealth’s impressive culinary scene. We recommend Food.Bar.Food if you’re in the Harrisonburg area or Mas in Charlottesville. The James River weaves across the state from Botetourt County all the way to Norfolk, where it empties into the Chesapeake Bay just north of the Atlantic Ocean. While many sections are slow-moving and calm, the section that rushes through Richmond contains some of the most thrilling rapids in Virginia. 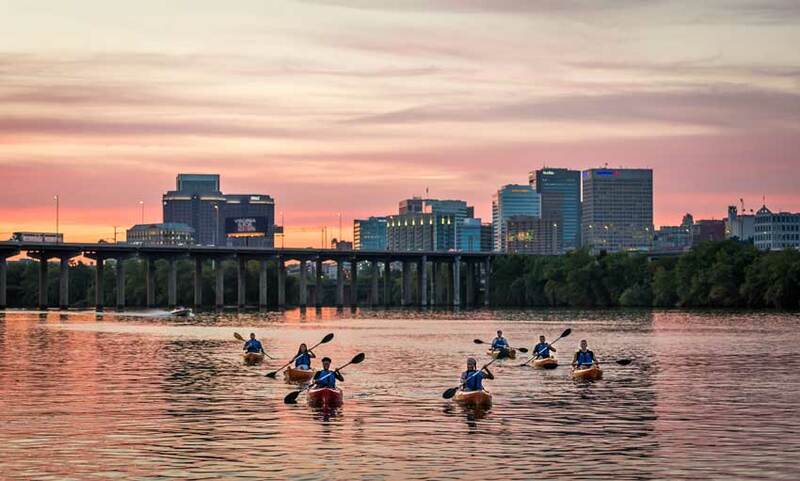 Rent a kayak through Riverside Outfitters in the capital city and join in for a group tour, or if you’re an experienced kayaker, get a map and learn about the most epic sections of raging waters on the James River. 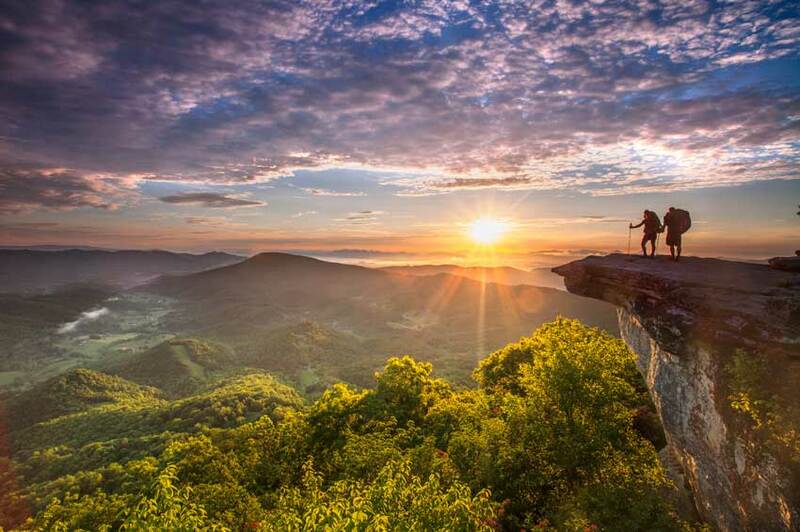 Hiking through Virginia provides an up-close look at the beauty found within the state, and we encourage every single visitor to tackle at least one short hike during their visit. While the Blue Ridge Parkway is a popular destination for scenic drives, there is also lots of hiking to be found off the roadway. If you’re a beginner, trails like Rocky Knob Picnic Loop Trail and Mabry Mill’s Mountain Industry Trail should be on your agenda. 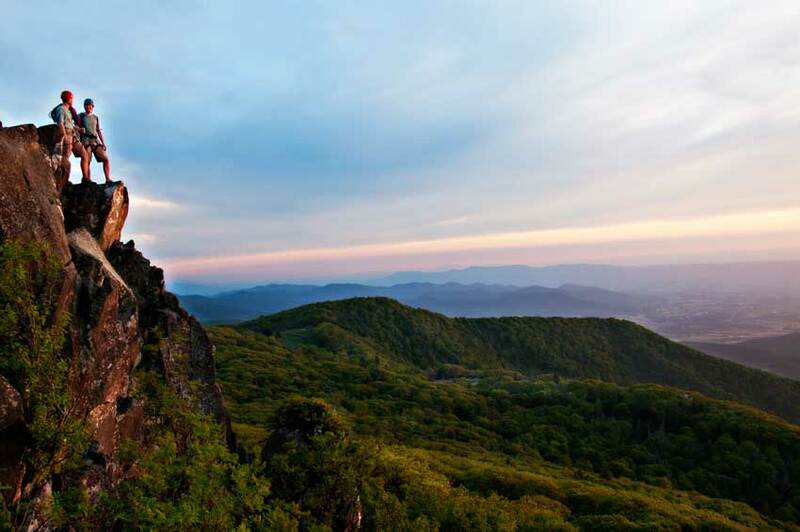 Fairly experienced climbers can head to Humpback Rocks, a 4.8 mile loop that includes a section of the Appalachian Trail (take the trailhead on the right side of the parking lot for a shorter, albeit steeper, 1.6 mile round-trip hike). Hiking trails like Flat Top and Sharp Top cater to the more experienced hikers with severe elevation climbs and rugged terrain. 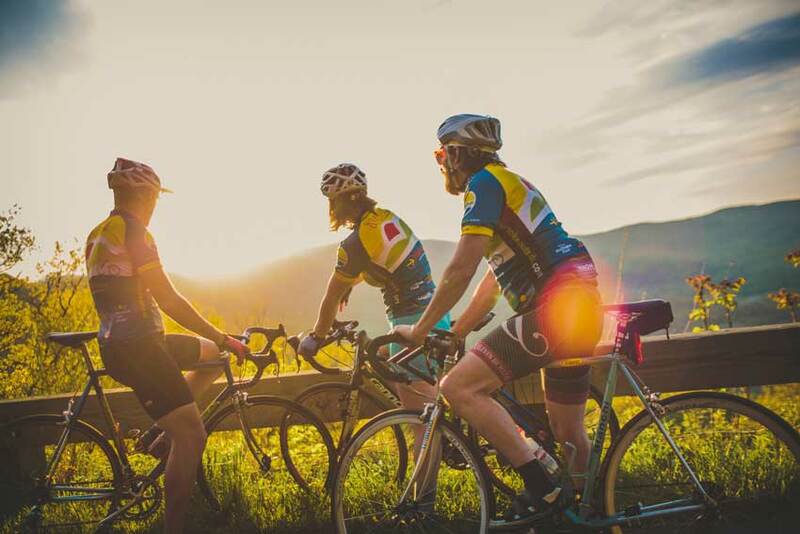 Virginia contains biking options for every cycling enthusiast, with mountain biking trails that wind through some of the most challenging terrain to the restored trails on converted railways. By converting old railroad tracks into bicycling trails, Virginia has created several new destinations for bicyclists looking for safe, family-friendly trails. 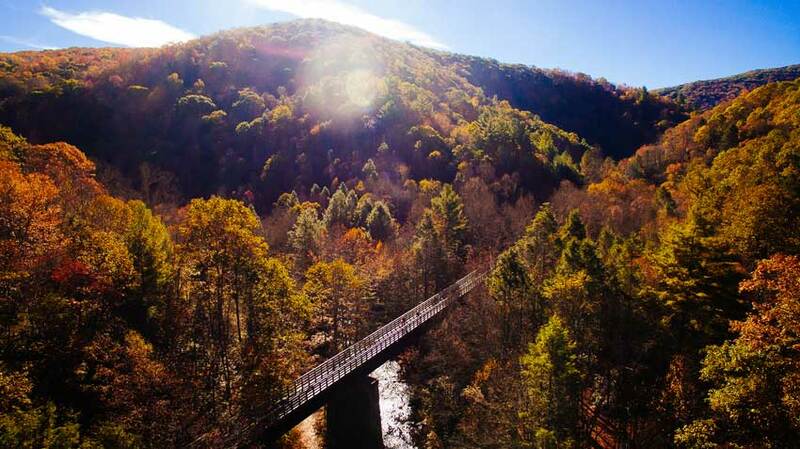 A popular rail-to-trail in the Southwest Virginia region, the Virginia Creeper Trail begins in Abingdon and runs 34 miles. However, due to the downhill slope of the trail, it is an easy cycling option for beginners. Several outfitters in the nearby towns of Damascus and Abingdon provide bike rentals and shuttle services to the top of the mountain. Get your adrenaline going with a mountain biking adventure at Massanutten’s new Mountain Bike Park. The resort’s course offers exciting tracks for veteran riders as well as beginner-friendly routes. Skilled road cyclists head to Skyline Drive and the Blue Ridge Parkway in Virginia. These routes have plenty of pull-off spots where riders can take quick breaks and enjoy the incredible scenery of the mountains. The 216 miles of Blue Ridge Parkway and 100 miles of Skyline Drive are world-renowned in the cycling community, bringing competitive riders from thousands of miles to test out their strenuous curves. 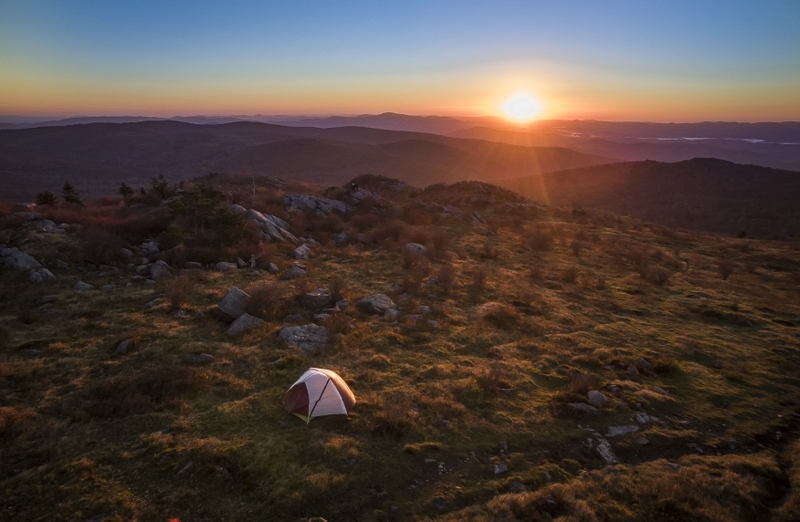 Skip the hotels and camp in the Great Outdoors of Virginia during your next vacation. If you’re interested in testing your mettle, consider backwoods primitive campsites only reachable by hike. These sites are recommended for experienced campers, as you need to secure backcountry permits ahead of time. Also, the backcountry campsites are often deep within the wood, and hikers must travel miles on steep trails with heavy camping gear in tow. A 13.8 mile total circuit, the Rockytop Big Run Loop near Waynesboro has several isolated campsites near the mid-point of the trail. Developed campgrounds with showers, playgrounds, and many other amenities can be found throughout Virginia, like Misty Mountain Camp Resort outside of Charlottesville. The campsite sits in the shadows of the Blue Ridge Mountains and is close to a multitude of wineries and breweries in the region. If the Great Outdoors beckons a little less urgently, glamping may be more your speed. Located on 20 acres at the base of the Blue Ridge Mountains, Rose River Farm has three fully furnished cedar and glass yurts available to guests. Reserve ahead of time, as these yurts book up quickly. Seeking an outdoor adventure to get your adrenaline pumping? Check out a few of these activities designed with the thrill-seekers in mind. 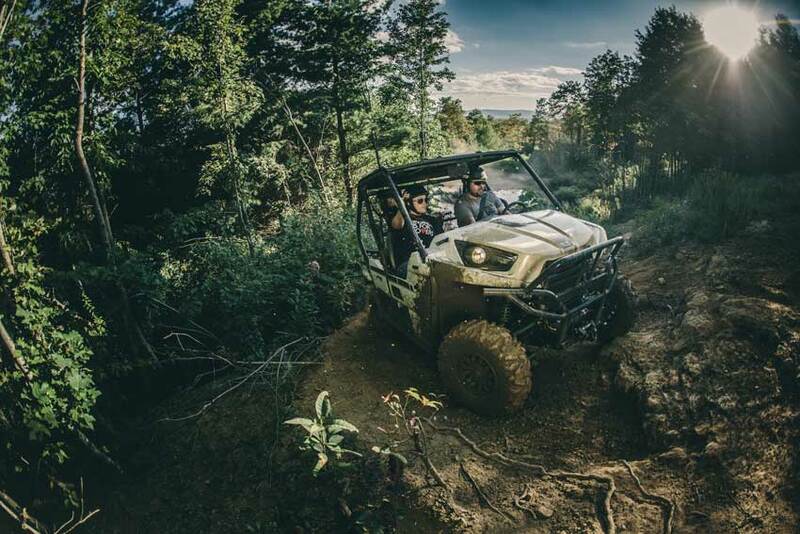 Bring your own ATVs, dirt bikes, and mountain bikes, or rent an ATV through Southern Gap Outdoor Adventure before hitting the rugged Spearhead Trails systems of Southwest Virginia. The routes wind through more than 350 miles of mountains and valleys, so even if you stay for a week, you’ll still have fresh trails waiting for you each morning. The latest addition, Haysi’s Ridgeview, added over 60 miles to the trails, welcoming dirt bikers, mountain bikers, ATV riders, and hikers to take in the spectacular views from the mountain peaks. See the Eastern shore from an entirely new perspective with a hang gliding tour through the Eastern Shore Hang Gliding Center. All daredevils ages 4 and up are invited to fly over the coastal landscapes on this aerial adventure. Fly over the valleys and treetops of Marion County on the Hungry Mother Adventures Zip Line Tour, now the longest, highest, and fastest zip line in Virginia. Five sections of lines total nearly a mile, giving you a bird’s-eye view of the beautiful scenery below. Outdoor festivals provide many of the activities listed above all in one place, creating a condensed outdoor experience in 2-4 days. 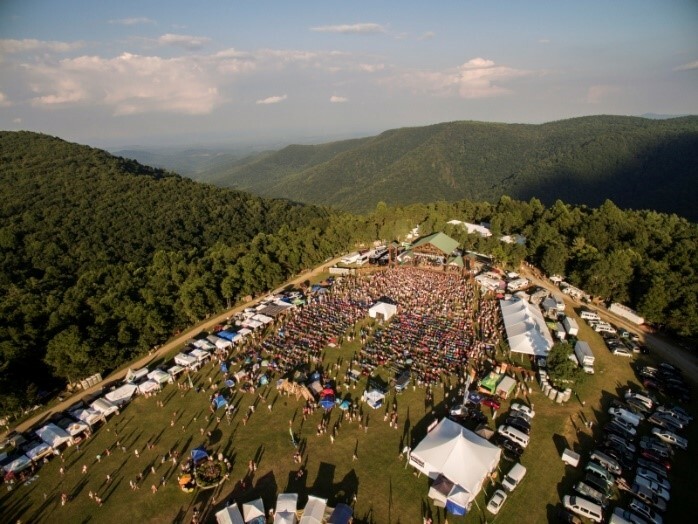 Get tickets to these festivals for an intro to all things outdoors in Virginia. This isn’t the sort of festival where spectators can sit and watch others perform; the Anthem Go Outside Festival, called GoFest for short, encourages you to get moving. Don’t have your own gear? Don’t sweat it! Vendors at the festival let you try out everything from kayaks to bicycles and participate in workshops to learn about a wide variety of outdoor sports. The festival allows leashed dogs and camping is available on-site, as well as plenty of local food, craft beer, and artisans showcasing their handcrafted goods. What’s your favorite outdoor pursuit in Virginia and where do you go when you’re looking to get back to nature?